Precision Premium dentures are personalized high quality dentures providing optimum function and best mimic of patient’s oral cavity. 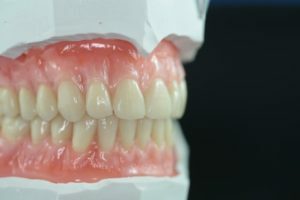 These dentures constructed from the impressions of your jaws, through the use of special instruments called Facebow and pin tracing device, to best mimic your jaw (TMJ) movements you make and all your facial information is recorded. Also, we are using premium teeth and other high quality materials in fabrication of precision premium dentures. Then, we are able to give you your natural contour of your lips and facial muscles as well as your smile.